Donated and dyed by HappyDebs, a member of our group, MCN Sock Weight Yarn in the Spring Garden colourway, 350m/383yds of 80% merino/10% cashmere/10% sock. 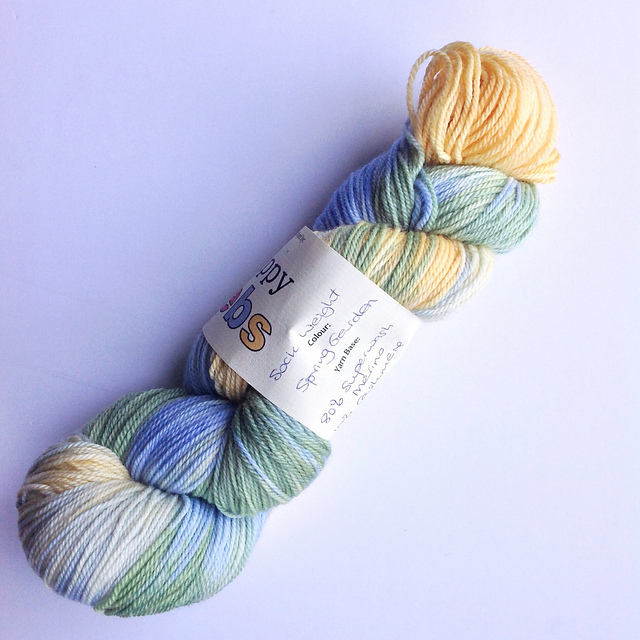 Kindly donated by another viewer is Sundara Sock Yarn in the Shadow Studies colourway. It's 100% superwash merino and 338m/370yds. Alessandra, aka PokedaGoblin donated this yarn specifically for this KAL. 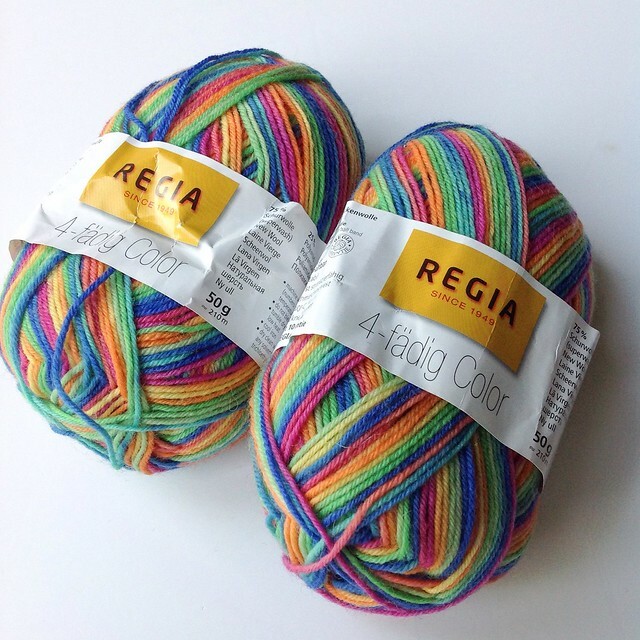 Two skeins of Regia 4-Fadig Color (a self striping yarn) in colouway 05048. Each skein measures 210m/230yds and weighs 50g. The yarn is made of 75% wool/25% polyamide. Finished Objects should be posted in this FO Thread (please no chat there). Please also read all the rules carefully before posting to make sure your project fits the rules. 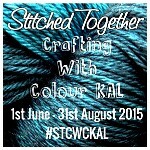 The KAL finishes on 31st August 2015. Make It Work by Allie Coffey of Caffeinated Knitting Podcast. I used yarn spun from Fondant Fibre Organic Merino in the Inked colourway. Knitty and Color Merino Silk in the Sleepy Hollow colourway. It's 80% merino and 20% silk. I spun it worsted with a 2ply constructions and 261m of a light DK weight, weighing 110g. Sara's Texture Crafts Merino in the Raspberry Chocolate colourway. I spun it worsted with a 4ply construction. I got 160m aran weight and it weighs 179g. Northbound Knitting Polwarth in the Flying Kites colourway. I spun it worsted with a 2ply construction aiming to get a barber pole effect. I got 178m of a worsted weight yarn weighing 105g. Textured Shawl by Stephanie Bold in The Knitting Goddess Laceweight 70% Baby Alpaca/20% Silk/10% Cashmere in the Greens colourway. This was knit for my friend Rachael who bought the yarn when she took me to Fibre East 2014. Felici Socks using Knit Picks Felici in the Afternoon colourway. My vanilla sock pattern with a Fish Lips Kiss Heel. I mention the Poke Me Not from Jan B Smiley and Emily of the Fibre Town Podcast. The Joker and The Thief by Melanie Berg. I'm using Wollmeise Pure in a WD version of Ein Klein Wenig Verrucht and couple of sets of mini skeins from Frankenskein Yarns in the Sour Heart colourway. I mention my HiyaHiya Kitty Snips. I got mine from Meadow Yarns. Skein Polwarth Silk in the Thyme colourway is being plied. 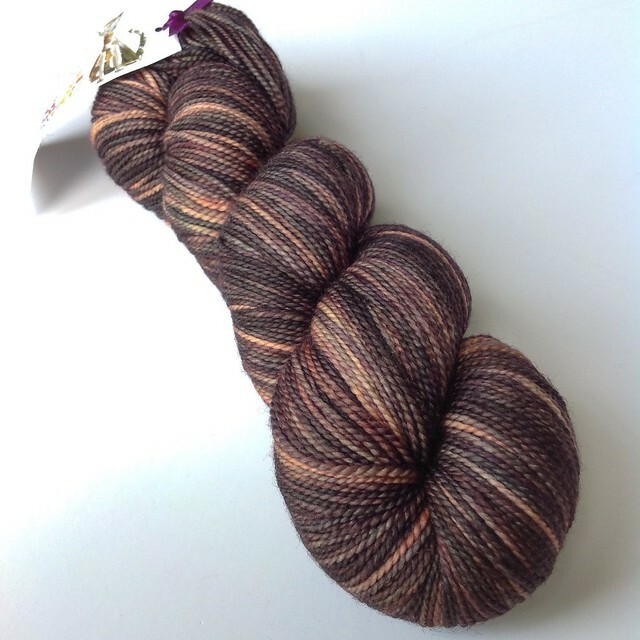 Countess Ablaze blend in the Extravagance and Cruelty colourway. 62% merino/12% alpaca/12% angelina/12% Seacell. It's stored in a basket from Julzcrafts. This is my Tour de Fleece 2015 spin. I'm in Team Caffeinated 2015, which is a very laid back group. I have also opened a thread in the Stitched Together Ravelry group for people who are sort of spinning along with the TdF but don't want any commitment. There aren't any prizes, just friendly support. Fondant Fibre Oatmeal BFL in the Luckenbooth colourway. Knitting some socks from Sock Architecture by Lara Neel. On The Round Superwash Targhee/Silk in the Silver Lining Tweed colourway. Countess Ablaze Viscount of Spark in the Nerds Prefer Their Rainbows Darker. MarigoldJen Merino/Silk Single (4ply) in the Serene colourway. Thank you for all the well wishes during my surgery and support in the aftermath!